ADAO wants YOUR voices to be heard! Turn your anger into action: Tweet, Facebook post, or email your six-word quote about how asbestos or mesothelioma has impacted your life. ADAO will launch our seventh “six-word quote campaign,” in which we invite asbestos disease patients and their families to write succinct messages to congress about how asbestos has affected their lives. Our unified voice is the strongest tool we have to fight against asbestos, and ADAO is proud to be a part of a great community that truly cares about each other. We will be traveling to Washington DC for a House of Representatives Staff Briefing, and we want to share all of your voices with congress. 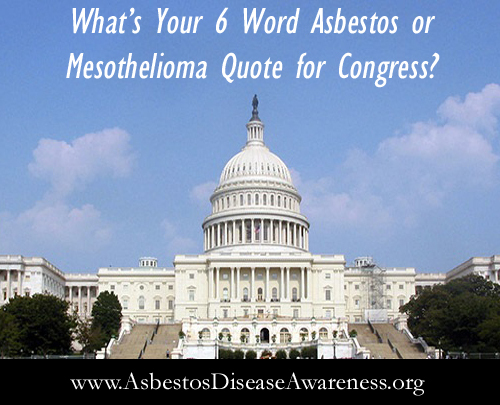 We would love for everyone to post a 6-word message on our Facebook telling congress how asbestos has affected your life or why congress should ban asbestos now. Your voice is so important, and we need to spread awareness of the dangers of asbestos exposure. Consumer, occupational, and environmental asbestos exposure continues, and it is a violation of human rights. From pain, comes action. Take a minute and read these powerful 6 word quotes about how these people feel and courageously share about asbestos. “Asbestos has changed my life – forever.” ~ Debbie, Note: Debbie tragically lost her life due to mesothelioma on June 9. *Please note that by submitting your quote you grant permission for ADAO to use your quote in educational and advocacy materials. ADAO will never sell, trade, or rent your personally identifiable information to third parties.